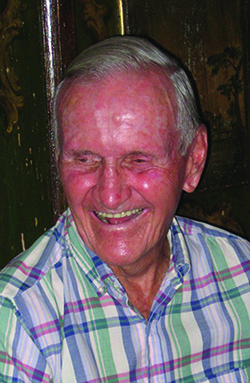 James Harrison Stanton, 98, of Boca Grande passed away from a heart attack while in his home on Wednesday, Jan. 6, 2016. He was an active, generous man devoted to his wife, Lucy, for 73 years, and to his children – Cinder, Tim, Peter and Chris. He was a great friend to many, a wise and loving husband, father and grandfather, as well as a superb athlete. Jim was born in 1917 to Louise Collier and Henry Thompson Stanton in Evanston, Illinois. He spent his childhood in Winnetka and Wayne, Illinois, and attended Kent School in Kent, Connecticut and Williams College, from which he graduated in 1940. Shortly thereafter he joined the United States Navy and served in the Pacific region throughout World War II. In 1942 he married Lucy Keeler, also from Winnetka. Lucy and Jim moved to San Francisco after the war and then to Marin County. In 1948 they moved to the New York City area where Jim and his brothers, Henry and Charles, took over Rystan Pharmaceutical Company, of which Jim served as general manager, retiring in 1983. In 1950 they settled in Katonah, New York, where they raised their family. From 1970 on they made their homes in Bedford, New York, and Williamstown, Massachusetts before becoming full-time residents of Boca Grande. Jim was active in local civic affairs, serving as treasurer of the Katonah Library and on the board of directors of the Bedford Golf and Tennis Club. He also served as treasurer at one time for St. Andrew’s Episcopal Church of Boca Grande. Jim was well known for his athletic prowess, beginning in high school and college. He captained many sports teams at Kent and Williams, and played on the junior Davis Cup tennis team. He was the Bedford Club’s champion and made the finals many times in golf and tennis. Jim is survived by his wife, Lucy; by his daughter, Lucia (Cinder) Stanton of Charlottesville, Virginia; by his sons, Timothy Stanton (Sherry) of Inverness, California, Peter Stanton of Winooski, Vermont and Christopher (Lori Fouts) of San Rafael, California; and by his grandchildren, Eliza McCarthy, Julie Caruccio and Caitlin, Erin, Max and Charlotte Stanton. The family is very grateful to all Boca Grande residents who loved and helped Jim and Luch, particularly to the Boca Grande Fire Department and their EMTs, who often came to pick Jim up. A memorial service was held this week on the island. In lieu of flowers, donations can be made to a charity of your choosing.